A lawyer in love with a Shakespearean scholar might find the perfect date night with Equivocation. Or a politician whose best friend is a Jesuit. Bill Cain’s play is a thicket of ideas about theater, politics and morality. His language manages to be natural, almost casual, despite the rich quotations of Shakespearean text and the monumental characters debating the difficult question of how to remain true to your ideals, and the truth itself, in dangerous times. Equivocation has received accolades since its 2009 world premiere by Oregon Shakespeare Festival, one of the country’s pre-eminent theater companies, and it’s now in performance by that company at Arena Stage. Cain wrote the play in the aftermath of September 11, 2001, when he started noticing a rise of disturbing doublespeak. He went back further in time to hold the mirror up, exploring what happens when a playwright is induced to produce propaganda about current events – in this case, being asked to dramatize the 1605 Gunpowder Plot to glorify King James I’s role. It’s fascinating how references to the Gunpowder Plot has resurfaced recently - V for Vendetta and Occupy Wall Street – as the mirror of history is turned back on itself again and again. Cain is interested in the propaganda of words, so he uses the ultimate wordweaver as the unlucky protagonist – Shakespeare himself. 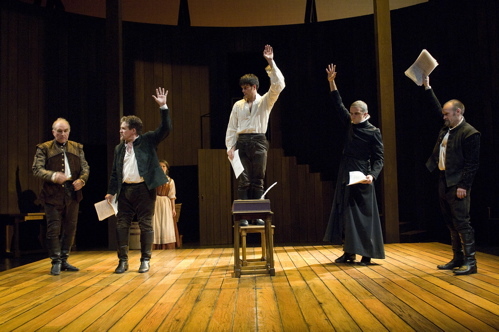 The cast of the Oregon Shakespeare Festival’s 2009 production of Equivocation, directed by Bill Rauch. Photo by Jenny Graham. Shag, as he’s known in the world of the play, is approached by Sir Robert Cecil to write a play about the Gunpowder Plot in which Protestant King James I is revealed as hero and savior against those dastardly Catholics scheming to blow up Parliament. Shag wants nothing to do with dramatizing current events – “you can’t legislate a soul into a country,” he rightly points out. The battle between the two men – magnificently played by Anthony Heald and Jonathan Haugen – is nothing short of titanic, Art vs. Politics, and yet the two actors make it achingly intimate. Heald’s hooded eyes contain worlds, “my brain is a graveyard,” he says, utterly believable as both poetic playwright and conflicted man. Haugen twists his body into Cecil’s physical torment, matching the mental torment inside as he watches the man he placed on the throne (John Tufts, in a devilish turn as James I) discard him like a wounded dog. 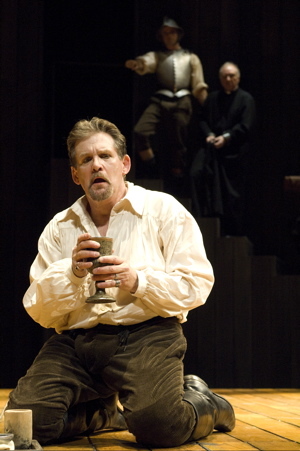 There’s a sad soul that winds its way through the play, as Shag is constantly confronted by the conscience he left behind in order to become a great playwright – his dour, neglected daughter Judith (Christine Albright), his lead actor and confidante Richard Burbage (Richard Elmore), the Catholicism of his parents embodied in the Jesuit priest Father Garnet (also Elmore, pitch perfect as both). Throughout his journey to discover the truth about the Gunpowder Plot, as draft after draft of the doomed play is acted out, we’re confronted by conscience as well – is it better to lie to save a man’s life or tell the truth to save your soul? Can equivocation, the act of answering the question under the question, really be a viable option, or is it just another act of cowardice? And most horrible of all, how would you behave under torture, could you really hold true to yourself when the consequence is having your guts pulled out while you still live? Words, words, words… a lesser company could drown under the weight of Cain’s words, referencing so many plays of the canon I lost track – not to mention all the political machinations, religious treatises, feuds between family and friends, chilling scenes of torture – yet somehow, it works. Somehow, impossibly, it makes for a fascinating evening as opposed to a boring snooze. Credit is not only due to the playwright, who makes debating Jesuit philosophy on equivocation interesting, but the company itself, whose sense of ensemble is the strongest I’ve seen on stage in some time. Tackling multiple roles with ease, their vocality both crisp and warm, the ensemble’s talent and commitment is evidence of the vitality of repertory theater. You truly believe this is a company of players dedicated to great theater, as they mirror the “cooperative venture” of The King’s Men. Oregon Shakespeare Festival’s production of Equivocation, at Arena Stage at the Mead Center for American Theater, through January 1, 2012. Arena Stage is located at 1101 Sixth Street SW, Washington, DC 20024. Closest Metro stop: Waterfront (Green line). For more information call 202-488-3300.